Are you enrolled in a managerial accounting class and finding yourself struggling? Fear not! 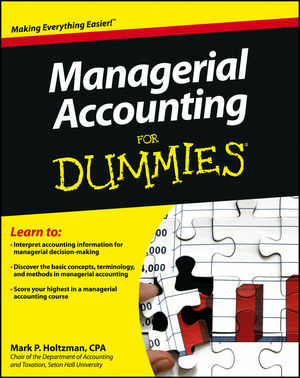 Managerial Accounting For Dummies is the go-to study guide to help you easily master the concepts of this challenging course. You'll discover the basic concepts, terminology, and methods to identify, measure, analyze, interpret, and communicate information in the pursuit of an organization's goals. Tracking to a typical managerial accounting course and packed with easy-to-understand explanations and real-life examples, Managerial Accounting For Dummies explores cost behavior, cost analysis, profit planning and control measures, accounting for decentralized operations, capital budgeting decisions, ethical challenges in managerial accounting, and much more. Managerial Accounting For Dummies makes it fast and easy to grasp the concepts needed to score your highest in a managerial accounting course. Mark P. Holtzman, PhD, CPA, is Chair of the Department of Accounting and Taxation at Seton Hall University. He has taught accounting at the college level for 17 years and runs the Accountinator website at www.accountinator.com, which gives practical accounting advice to entrepreneurs.